Answers and rationales (if any) are given below. Be sure to read them. During the shift of a triage nurse in the Emergency Department (ED), the following clients arrive. Which client needs the most rapid response to protect other clients in the ED from infection? Option C: Prioritization. Varicella or chickenpox is spread by airborne means and could be quickly transmitted to other clients in the ED. The child with a rash should be immediately isolated from the other clients through placement in a negative-pressure room. Option A: The client who has been exposed to TB does not set other clients at risk for infection because there are no symptoms of active TB. Options B and D: Droplet and/or contact precautions should be instituted for the clients with possible pertussis and MRSA infection, but this can be achieved after isolating the child with possible chickenpox. Option A: Prioritization. Gloves and a gown should be applied when coming in contact with linens that may be contaminated by the client's wound secretions. Options B, C, D, and E: The other PPE items are not necessary, because transmission by splashes, droplets, or airborne means will not occur when the bed is changed. Which action will the nurse take to most effectively reduce the incidence of hospital-related urinary tract infections (UTI)? Option C: Prioritization. The most effective way to lessen UTIs in the hospital setting is to avoid using retention catheters. Nurses are associated with promoting policies that lessen the unnecessary use of catheters because the use of catheters is the most common cause of hospital-acquired UTIs in the United States. Options A, B, and D: The other options also reduce risk for and/or detect UTIs, but avoidance of indwelling catheter use will be more effective. A 90-year-old client is confined to the unit for two weeks. He has been receiving antibiotics for more than a week and tells that he is having frequent watery stools. Which action will you take first? Option A: Prioritization. The client may have Clostridium difficile infection based on his age, history of antibiotic therapy, and watery stools. The initial action should be to place him on contact precautions to prevent the spread of C. difficile to other clients. Options B, C, and D: The other actions are also necessary and should be taken after placing the client on contact precautions. The nurse is assigned to a client with meningococcal meningitis. Which information about the client is the best indicator that the nurse can discontinue droplet precautions? Option A: Contemporary CDC evidence-based guidelines indicate that droplet precautions for clients with meningococcal meningitis can be discontinued when the client has received antibiotic therapy (with drugs that are effective against Neisseria meningitidis) for 24 hours. Options B, C, and D: The other information may mean that the client's condition is improving but does not mean that droplet precautions should be stopped. There are four clients with infections in the ED and only one private room is available. Which among the clients is the most appropriate to occupy the private room? Option A: Prioritization. Private rooms should be occupied mainly for clients with infections that require airborne precautions such as TB. Option B: Standard precautions are required for the client with toxic shock syndrome. Options C and D: Clients with C. difficile and VRE infections that require contact precautions should ideally be placed in private rooms; however, they can be placed in rooms with other clients with the same diagnosis. Option C: Prioritization. The nurse should don an N95 respirator or high-efficiency particulate air filter respirator, a gown, and gloves because herpes zoster (shingles) is spread through airborne means and by direct contact with lesions. Options A, B, D, and E: Surgical face masks filter particularly large particles and will not render protection from herpes zoster. Goggles and shoe covers are not required for airborne or contact precautions. A newly admitted client is suspected to have avian influenza ("bird flu") due to increasing dyspnea and dehydration. Which of these prescribed actions will the nurse implement first? Option D: Prioritization. The nurse first action should be to start oxygen therapy because the respiratory manifestations linked to avian influenza are most likely life-threatening. Options A, B, and C: The other actions should also be implemented after addressing the client's respiratory problems. The charge nurse is delegating tasks to her subordinates in the medical unit. Which infection control activity should she assign to an experienced nursing assistant? Option C: Nursing assistants can support agency policy to disinfect items that come in contact with intact skin such as blood pressure cuffs by cleaning with chemicals like alcohol. Options A, B, and D: The use of immunosuppressants, teaching, and assessment for upper respiratory tract symptoms require further education and a broader scope of practice. 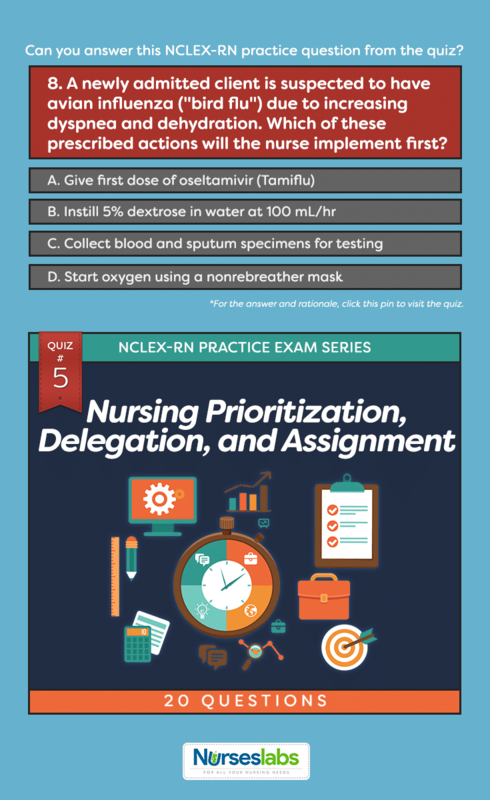 These tasks should be performed by licensed nurses. The nurse is caring for a client with a leg ulcer that is infected with vancomycin-resistant S. aureus (VRSA). Which of the following nursing actions can a nurse assign to an LPN/LVN? Option B: Delegation. Performing dressing changes and obtaining specimens for wound culture are part of the LPN/LVN education and scope of practice. Options A, C, and D: Assessment, education, and planning of care are complex actions that should be carried out by an RN. The charge nurse from the unit receives a call from the pediatrician wanting to admit an 8-year-old child with rubeola (measles). Which of the following is of most concern in deciding whether to admit the child to the unit? The unit is not staffed with the usual number of RNs. Option C: Prioritization. The child cannot be admitted to the pediatric unit without the implementation of airborne precautions which is required for clients with rubeola. Options A, B, and D: The other conditions may require actions such as staff reassignments but would not prevent the admission of a client with rubeola. Option C: Delegation. The nursing assistant is capable of stocking the room and posting the precautions on the client's door because all staff who care for clients should be familiar with the various types of isolation. Reminding visitors about previously taught information is a task of the nursing assistant although the RN is responsible for the initial teaching. Option A: Client education and discussion of the reason for the protective isolation fall within the RN-level-scope of practice. Option B: Prioritization. This order will prevent contact of the contaminated gloves and gown with areas like the hair that cannot be readily cleaned after client contact and stop transmission of microorganisms to the nurse and the client. The correct order for donning and removal of PPE has been standardized by agencies such as the Centers for Disease Control and Prevention (CDC) and the Occupational Safety and Health Administration. The nurse assessed the client and noted shortness of breath and recent trip to China. The client is strongly suspected of having Severe Acute Respiratory Syndrome (SARS). Which of these prescribed actions will the nurse take first? Option A: Prioritization. SARS is considered deadly so the initial action is to protect other clients and healthcare workers by securing the client in isolation. If an airborne-agent isolation (negative-pressure) room is not yet available, droplet precautions should be initiated until the client can be moved to a negative-pressure room. Options B, C, and D: The other actions should also be taken immediately but are not as important as preventing transmission of the disease. The nurse is caring for four clients receiving IV infusions of normal saline. Which client is at highest risk for bloodstream infection? Option A: Prioritization. Central lines are associated with a higher infection risk, the skin of the neck and chest have high numbers of microorganisms, and the line is nontunneled: such factors increase the risk for infection. Option B: Implanted ports are placed under the skin and so are less likely to be associated with catheter infection than a nontunneled central IV line. Options C and D: Peripherally inserted IV lines such as PICC lines and midline catheters are associated with a lower incidence of infection. Grant written information about infection control to all parents. Ensure that students are immunized according to national guidelines. Make soap and water easily accessible in the classrooms. Educate students on how to cover their mouths when coughing. Option B: Prioritization. The incidence of once-common infectious diseases like measles, chickenpox, and mumps has been most effectively reduced by immunization of all school-aged children. Options A, C, and D: The other options are also important but will not have much impact as immunization. The nurse is caring for a client with a vancomycin-resistant enterococcus (VRE) infection. Which action can be delegated to the nursing assistant? Implement contact precautions when caring for the client. Monitor the results of ordered laboratory culture and sensitivity test. Teach the client and family members about means to prevent transmission of VRE. Interact with other departments when the client is transported for ordered tests. Option A: Delegation. Correct implementation of contact precautions should be well-known by the hospital staff. Options B, C, and D: The other actions should be carried out by licensed nurses, whose education includes monitoring of laboratory results, client education, and methods of minimizing contamination when transporting infected clients. A client who has frequent watery stool is admitted to the unit due to dehydration possibly caused by C. difficile. Which nursing action should the charge nurse delegate to an LPN/LVN? Option A: Delegation. LPN/LVN scope of practice and education include administration of medications. Options B, C, and D: Assessment of hydration status, client and family education, and assessment of client risk factors for diarrhea should be done by the RN. A 25-year-old client comes to the outpatient unit with complaints of diarrhea, abdominal pain, shortness of breath, and epistaxis. Which action should the nurse take first? Option B: Prioritization. Based on the client's manifestations, avian influenza ("bird flu") is suspected. Outbreaks of bird flu have occurred in Asia or the Middle East. Airborne and contact precautions should be instituted immediately. Options A, C, and D: Theses may also be relevant but are not the primary action to take for the client, who may transfer the infection to other clients or staff members. A mother of a 14-year-old client receiving chemotherapy for leukemia calls out to the unit concerning her other child having chickenpox. Which of these actions will the nurse anticipate taking next? Option D: Prioritization. The development of varicella in high-risk clients can be prevented via administration of varicella-zoster immune globulin prescribed by the physician. Options A and C: Acyclovir therapy and hospitalization may be required if the child develops a varicella-zoster virus infection. Option B: Contact and airborne precautions will be implemented to prevent spread of infection to other children if the child develops varicella. 1. During the shift of a triage nurse in the Emergency Department (ED), the following clients arrive. Which client needs the most rapid response to protect other clients in the ED from infection? 3. Which action will the nurse take to most effectively reduce the incidence of hospital-related urinary tract infections (UTI)? 4. A 90-year-old client is confined to the unit for two weeks. He has been receiving antibiotics for more than a week and tells that he is having frequent watery stools. Which action will you take first? 5. The nurse is assigned to a client with meningococcal meningitis. Which information about the client is the best indicator that the nurse can discontinue droplet precautions? 6. There are four clients with infections in the ED and only one private room is available. Which among the clients is the most appropriate to occupy the private room? 8. A newly admitted client is suspected to have avian influenza (“bird flu”) due to increasing dyspnea and dehydration. Which of these prescribed actions will the nurse implement first? 9. The charge nurse is delegating tasks to her subordinates in the medical unit. Which infection control activity should she assign to an experienced nursing assistant? 10. The nurse is caring for a client with a leg ulcer that is infected with vancomycin-resistant S. aureus (VRSA). Which of the following nursing actions can a nurse assign to an LPN/LVN? 11. The charge nurse from the unit receives a call from the pediatrician wanting to admit an 8-year-old child with rubeola (measles). Which of the following is of most concern in deciding whether to admit the child to the unit? 13. In which order will the nurse perform the following actions as she prepares to leave the room of a client with airborne precautions after performing oral suctioning? 14. The nurse assessed the client and noted shortness of breath and recent trip to China. The client is strongly suspected of having Severe Acute Respiratory Syndrome (SARS). Which of these prescribed actions will the nurse take first? 15. The nurse is caring for four clients receiving IV infusions of normal saline. Which client is at highest risk for bloodstream infection? 17. The nurse is caring for a client with a vancomycin-resistant enterococcus (VRE) infection. Which action can be delegated to the nursing assistant? A. Implement contact precautions when caring for the client. B. Monitor the results of ordered laboratory culture and sensitivity test. C. Teach the client and family members about means to prevent transmission of VRE. D. Interact with other departments when the client is transported for ordered tests. 18. A client who has frequent watery stool is admitted to the unit due to dehydration possibly caused by C. difficile. 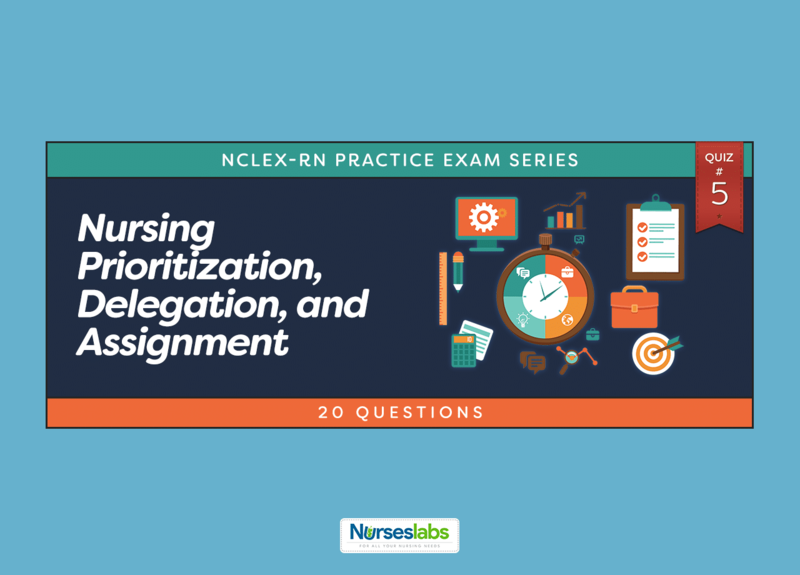 Which nursing action should the charge nurse delegate to an LPN/LVN? 19. A 25-year-old client comes to the outpatient unit with complaints of diarrhea, abdominal pain, shortness of breath, and epistaxis. Which action should the nurse take first? 20. A mother of a 14-year-old client receiving chemotherapy for leukemia calls out to the unit concerning her other child having chickenpox. Which of these actions will the nurse anticipate taking next? Option C: Prioritization. Varicella or chickenpox is spread by airborne means and could be quickly transmitted to other clients in the ED. The child with a rash should be immediately isolated from the other clients through placement in a negative-pressure room. Option A: The client who has been exposed to TB does not set other clients at risk for infection because there are no symptoms of active TB. Options B and D: Droplet and/or contact precautions should be instituted for the clients with possible pertussis and MRSA infection, but this can be achieved after isolating the child with possible chickenpox. Option A: Prioritization. Gloves and a gown should be applied when coming in contact with linens that may be contaminated by the client’s wound secretions. Options B, C, D, and E: The other PPE items are not necessary, because transmission by splashes, droplets, or airborne means will not occur when the bed is changed. Option C: Prioritization. The most effective way to lessen UTIs in the hospital setting is to avoid using retention catheters. Nurses are associated with promoting policies that lessen the unnecessary use of catheters because the use of catheters is the most common cause of hospital-acquired UTIs in the United States. Options A, B, and D: The other options also reduce risk for and/or detect UTIs, but avoidance of indwelling catheter use will be more effective. Option A: Prioritization. The client may have Clostridium difficile infection based on his age, history of antibiotic therapy, and watery stools. The initial action should be to place him on contact precautions to prevent the spread of C. difficile to other clients. Options B, C, and D: The other actions are also necessary and should be taken after placing the client on contact precautions. Option A: Contemporary CDC evidence-based guidelines indicate that droplet precautions for clients with meningococcal meningitis can be discontinued when the client has received antibiotic therapy (with drugs that are effective against Neisseria meningitidis) for 24 hours. Options B, C, and D: The other information may mean that the client’s condition is improving but does not mean that droplet precautions should be stopped. Option A: Prioritization. Private rooms should be occupied mainly for clients with infections that require airborne precautions such as TB. Option B: Standard precautions are required for the client with toxic shock syndrome. Options C and D: Clients with C. difficile and VRE infections that require contact precautions should ideally be placed in private rooms; however, they can be placed in rooms with other clients with the same diagnosis. Option C: Prioritization. The nurse should don an N95 respirator or high-efficiency particulate air filter respirator, a gown, and gloves because herpes zoster (shingles) is spread through airborne means and by direct contact with lesions. Options A, B, D, and E: Surgical face masks filter particularly large particles and will not render protection from herpes zoster. Goggles and shoe covers are not required for airborne or contact precautions. Option D: Prioritization. The nurse first action should be to start oxygen therapy because the respiratory manifestations linked to avian influenza are most likely life-threatening. Options A, B, and C: The other actions should also be implemented after addressing the client’s respiratory problems. Option C: Nursing assistants can support agency policy to disinfect items that come in contact with intact skin such as blood pressure cuffs by cleaning with chemicals like alcohol. Options A, B, and D: The use of immunosuppressants, teaching, and assessment for upper respiratory tract symptoms require further education and a broader scope of practice. These tasks should be performed by licensed nurses. Option B: Delegation. Performing dressing changes and obtaining specimens for wound culture are part of the LPN/LVN education and scope of practice. Options A, C, and D: Assessment, education, and planning of care are complex actions that should be carried out by an RN. 11. Answer: C. No negative-airflow rooms are available on the unit. Option C: Prioritization. The child cannot be admitted to the pediatric unit without the implementation of airborne precautions which is required for clients with rubeola. Options A, B, and D: The other conditions may require actions such as staff reassignments but would not prevent the admission of a client with rubeola. Option C: Delegation. The nursing assistant is capable of stocking the room and posting the precautions on the client’s door because all staff who care for clients should be familiar with the various types of isolation. Reminding visitors about previously taught information is a task of the nursing assistant although the RN is responsible for the initial teaching. Option A: Client education and discussion of the reason for the protective isolation fall within the RN-level-scope of practice. Option A: Prioritization. SARS is considered deadly so the initial action is to protect other clients and healthcare workers by securing the client in isolation. If an airborne-agent isolation (negative-pressure) room is not yet available, droplet precautions should be initiated until the client can be moved to a negative-pressure room. Options B, C, and D: The other actions should also be taken immediately but are not as important as preventing transmission of the disease. Option A: Prioritization. Central lines are associated with a higher infection risk, the skin of the neck and chest have high numbers of microorganisms, and the line is nontunneled: such factors increase the risk for infection. Option B: Implanted ports are placed under the skin and so are less likely to be associated with catheter infection than a nontunneled central IV line. Options C and D: Peripherally inserted IV lines such as PICC lines and midline catheters are associated with a lower incidence of infection. 16. Answer: B. Ensure that students are immunized according to national guidelines. Option B: Prioritization. The incidence of once-common infectious diseases like measles, chickenpox, and mumps has been most effectively reduced by immunization of all school-aged children. Options A, C, and D: The other options are also important but will not have much impact as immunization. Option A: Delegation. Correct implementation of contact precautions should be well-known by the hospital staff. Options B, C, and D: The other actions should be carried out by licensed nurses, whose education includes monitoring of laboratory results, client education, and methods of minimizing contamination when transporting infected clients. Option A: Delegation. LPN/LVN scope of practice and education include administration of medications. Options B, C, and D: Assessment of hydration status, client and family education, and assessment of client risk factors for diarrhea should be done by the RN. Option B: Prioritization. Based on the client’s manifestations, avian influenza (“bird flu”) is suspected. Outbreaks of bird flu have occurred in Asia or the Middle East. Airborne and contact precautions should be instituted immediately. Options A, C, and D: Theses may also be relevant but are not the primary action to take for the client, who may transfer the infection to other clients or staff members. Option D: Prioritization. The development of varicella in high-risk clients can be prevented via administration of varicella-zoster immune globulin prescribed by the physician. Options A and C: Acyclovir therapy and hospitalization may be required if the child develops a varicella-zoster virus infection. Option B: Contact and airborne precautions will be implemented to prevent spread of infection to other children if the child develops varicella.